Emmerson Mnangagwa was officially sworn in as president of Zimbabwe on Sunday after winning a bitterly contested election that marked the country’s first vote since strongman Robert Mugabe was ousted from power. Mnangagwa, whose victory in the July 30 polls was challenged by the main opposition, pledged to “protect and promote the rights of Zimbabweans” in an inauguration ceremony attended by thousands of supporters at a stadium in Harare. 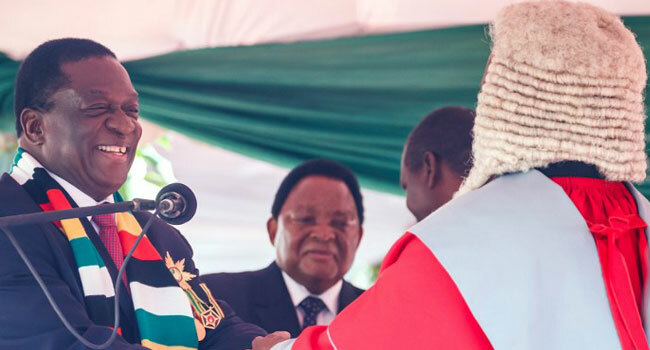 “I Emmerson Dambudzo Mnangagwa swear that as president of the Republic of Zimbabwe I will be faithful to Zimbabwe (and) will obey uphold and defend the constitution of Zimbabwe,” Mnangagwa said in an oath greeted by thunderous applause from a crowd that also included several African heads of state. The newly-minted leader has hailed his election victory as a fresh start for Zimbabwe after years of repression and economic mismanagement under his predecessor which left the country burdened by shattered public services, mass poverty and unemployment. But his reforming promises, including to entice back investors, were marred by the army opening fire on protesters, killing six shortly after the poll, allegations of vote-rigging and a violent crackdown on opposition activists. Supporters, many wearing caps and T-shirts emblazoned with Mnangagwa’s image, filed into the Harare stadium on Sunday under banners proclaiming “Celebrating a new Zimbabwe” and “Unity takes us forward, peace keeps us going”. “We were stressed with what was happening with the court procedures (hearing opposition appeals of vote fraud) but we are happy now because everything has been finalized and we want people to unite and work together,” said supporter Malvern Makoni at the event. Mnangagwa of the ruling ZANU-PF party won the election with 50.8 percent of the vote — just enough to meet the 50 percent threshold needed to avoid a run-off against the main opposition led by Nelson Chamisa, who scored 44.3 percent. The country’s top court on Friday dismissed Chamisa’s bid to have the results annulled after he challenged the results, claiming they were rigged.